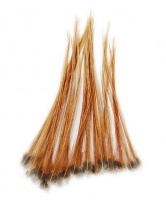 These packets of selected genetic hackle feathers suitable for all your dry flies. They represent a more affordable way of dressing dry flies than buying a full or half genetic cape. Each packet contains over 20 genetic hackles.